News on Breaking Dawn Production aka NO news on Breaking Dawn Production! Today two posts came out referencing news behind the production of Breaking Dawn. While a few months ago we all thought making BD was a foregone conclusion and Summit was just waiting for New Moon to shatter box office records to make it official it’s been almost a month and a half since New Moon’s release and still no announcement. Since news on the twi front has been about as sparse as smiles at a KStew photoshoot, so any sort of news to come out will indefinitely make waves. But after reading both posts from the bitchtastic Ted C and a dude in his mom’s basement in North East Philly we learn… exactly… NOTHING. Why yes, it’s like a Robsten rumor… a lot of drama, a lot of words, a lot of retweets, a lot of “maybe’s” but no actual substance or truth. Someone at the LA Times spoke with producer Wyck Godrey and got this bit of totally evasive information regarding the splitting of BD into two films “…If it’s not organic, I don’t think it will be done, and if it is, it will be…” Wow, heavy. 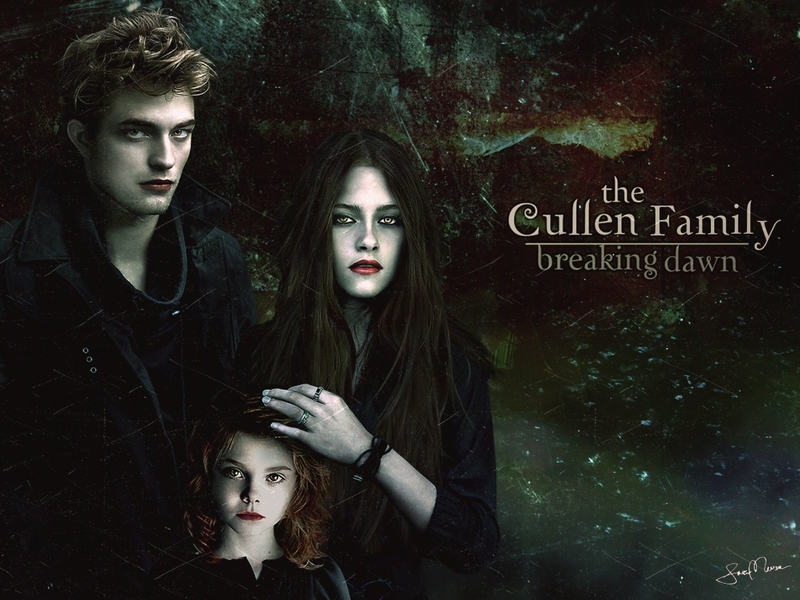 Breaking Dawn = tons more creepy images made by fans! So we still don’t know if it will be made into two films (please say yes), whether Summit will hire geneticists to create a human vampire hybrid in their lair of doom (aka studio offices in Santa Monica) to play Renesmee, whether Taylor Lautner will in fact act out imprinting on a newborn baby, if Nikki Reed and KStew can patch up their differences long enough to play convincing as frenemies on screen, will Jacob and Leah spend 3/4ths of the movie running around the perimeter of the Cullen’s house “on patrol” thus reenacting the most boring parts of BD, will there be a behind the scene documentary on the making of Isle Esme which features all the “fade to black” scenes they cut out? Sooooo many questions and ZERO answers. I know you’re probably pretty bummed that Rob’s been in town since Tuesday and hasn’t called you yet. I wouldn’t take it too personally. He just got here and he needs to get fitted for his tux, try on his shoes, shave, unpack his one pair of pants and black shoes, grab some in-and-out, pleasure theMoonisDown (& wish it was me), etc. etc. He’s keeping a pretty tight schedule. I’m gonna take a wild guess at what you were expecting to happen with Rob in town, and well, he isn’t going there, girl. I’m not sure what happened the first time around, back on some drunken night in Portland, but I do know Rob isn’t doing it again. Those were the days when he “couldn’t get a date” and was “fat” and “lived in a crack flat with TomStu.” Now he can “get lots of dates”, is “in no way fat” (only delicious) and, well, I guess he potentially still does live in that crack flat with TomStu, but that’s besides the point. You’re just not necessary. I know you thought you were- but that one time was just that- one time. And it only happened b/c you stumbled into his room, drunk, and he thought it would be more interesting than “playing his own trumpet” that night. That’s it. Sorry to be the bearer of bad news, but Round Two is a no-go. You’re busy though, right? Since you’re such a brilliant actress, you really have to start working on your craft again.. it’s going to take WEEKS to perfect your steely Rosalie glare (if you can even perfect it). Plus, being the world’s most perfect fake-lesbian with Kristen really is an all-consuming activity.